061: Can Growth Mindset live up to the hype? Growth mindset is everywhere these days. Dr. Carol Dweck’s research showing that a growth mindset can help children to overcome academic struggles is being incorporated to curriculum planning across the U.S. and in many other countries, and school districts in California are even using it to evaluate schools’ performance. I get ads popping up in my Facebook feed every day for a journal that helps children to develop a growth mindset, and judging from the comments those folks selling the journal are doing very nicely for themselves. Which means that the science underlying the idea of growth mindset must be rock solid, right? Well, perhaps you might be surprised (or not, if you’re a regular listener) to know that this actually isn’t the case. The main study on which the entire growth mindset theory is based has never been replicated, which is the gold standard for considering whether an effect that was found in a study is really real. And a variety of subsequent studies supporting the findings of the original one were either so tiny as to be not useful or failed to find any relevant effect (although in some cases they went on to report their findings as if they did…). We’ll tease all this out in the episode, and will discuss whether growth mindset is something worth fostering in your child. Bandura, A. (1981). Self-referent thought: A developmental analysis of self-efficacy. In J.H. Flavell & L. Ross (Eds. ), Social cognitive development: Frontiers and possible futures. Cambridge, UK: Cambridge University Press. Baumeister, R.F., Campbell, J.D., Krueger, J.I., & Vohs, K.D. (2003). Does high self-esteem cause better performance, interpersonal success, happiness, or healthier lifestyles? Psychological Science in the Public Interest 4(1), 1-44. Boykin, A.W., Albury, A., Tyler, K.M., Hurley, E.A., Bailey, C.T., & Miller, O.A. (2005). Culture-based perceptions of academic achievement among low-income elementary students. Cultural Diversity and Ethnic Minority Psychology 11, 339-50. Briggs, D.C. (1970). Your child’s self-esteem. Garden City, NY: Doubleday. Burnette, J.L., VanEpps, E.M., O’Boyle, E.H., Pollack, J.M., & Finkel, E.J. (2013). Mind-sets matter: A meta-analytic review of implicit theories and self-regulation. Psychological Bulletin 139(3), 655-701. Cimpian, A., Mu, Y., & Erickson, L.C. (2012). Who is good at this game? Linking an activity to a social category undermines children’s achievement. Psychological Science 23(5), 533-541. Claro, S., Paunesku, D., & Dweck, C.S. (2016). Growth mindset tempers the effects of poverty on academic mindset. PNAS 113(31), 8664-8668. Duckworth, A.L., & Seligman, M.E.P. (2005). Self-discipline outdoes IQ in predicting academic performance of adolescents. Psychological Science 16, 939-944. Gunderson, E.A., Gripshover, S.J., Romero, C., Dweck, C.S., Goldin-Meadow, S., & Levine, S.C. (2013). Parent praise to 1- to 3-year-olds predicts children’s motivational frameworks 5 years later. Child Development 84(5), 1526-1541. Haimovitz, K., & Dweck, C.S. (2016). Parents’ views of failure predict children’s fixed and growth intelligence mind-sets. Psychological Science 27, 859-869. Lazowski, R.A., & Hulleman, C.S. (2016). Motivation intentions in education: A meta-analytic review. Review of Educational Research 86(2), 602-640. Mueller, C.M., & Dweck, C.S. (1996, April). Implicit theories of intelligence; relation of parental beliefs to children’s expectations. Poster session presented at Head Start’s Third National Research Conference, Washington, D.C.
Noddings, N. (2005). The challenge to care in schools: An alternative approach to education (2ndEd.). New York, NY: Teachers College Press. Paunesku, D., Walton, G.M., Romero, C., Smith, E.N., Yeager, D.S., & Dweck, C.S. (2015). Mind-set interventions are a scalable treatment for academic underachievement. Psychological Science 26(6), 784-793. Pomerantz, E.M., & Kempner, S.G. (2013). Mothers’ daily person and process praise: Implications for children’s theory of intelligence and motivation. Developmental Psychology 49(11), 2040-2046. Schmidt, J.A., Shumow, L., & Kackar-Cam, H.Z. (2017). Does mindset intervention predict students’ daily experience in classrooms? A comparison of seventh and ninth graders’ trajectories. Journal of Youth and Adolescence 46, 582-602. Schmidt, J.A., Shumow, L., & Kackar-Cam, H.K. (2015). Exploring teacher effects for mindset intervention outcomes in seventh grade science classes. Middle Grades Research Journal 10(2), 17-32. Wentzel, K.R. (1997). Student motivation in middle school: The role of perceived pedagogical caring. Journal of Educational Psychology 89(3), 411-419. Hello and welcome to the Your Parenting Mojo podcast. Today we’re going to talk about Professor Carol Dweck’s work on Mindset. We’ll walk through overview of what Mindset is and the study on which it is based, and then we’ll spend quite a bit of time evaluating the research to help us understand whether the effect that Professor Dweck describes is real and if it is, what implications it has for our children and students. The topic of Mindset has been on my mind (as it were) as an episode topic for a while but I’m in the final throes of creating content for my course on how parents can support children’s learning in school, and one of the topics I wanted to address there was related to mindset, so I figured I’d kill two birds with one stone and cover it here too. Professor Dweck began her research as a graduate student in the ‘70s so this idea has been around for a while now and I was once told that you’d have to have been living under a rock to not have heard of it (although I confess that I hadn’t until not long before that), but I’ll describe the theory anyway in case you haven’t heard of it. Psychologists have been studying motivation for a long time, and especially motivation to learn, and there are a variety of different theories on what does motivate people to learn. Research on mindsets work traces a line back to the famous psychologist Albert Bandura’s theory of self-efficacy, which is about how people think about what they can achieve. Self-efficacy theory says that people evaluate their perceptions of their ability at a task, the difficulty of the task, how much effort it will take to complete, the amount of help that might be needed, situational circumstances, and whether or not they have succeeded or failed in the past when they determine how much effort they are going to put into a task in front of them. 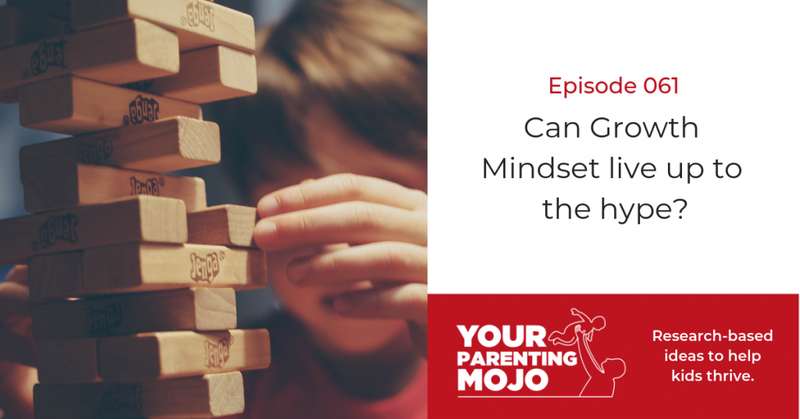 The research specifically on mindset stems from a paper published in 1998 by Professor Dweck and Professor Claudia Mueller, who were both then at Columbia University, on what motivates children to learn after they have experienced success or failure. The professors conducted a series of six short studies on 128 fifth-graders, half of whom were mostly white and attended elementary school in a small mid-western town, and half of whom were from two racially diverse schools in a large northeastern city (and I will give them kudos for testing their work on a racially diverse sample rather than testing on middle-class white children and assuming the results are applicable to all children). The professors wanted to find out whether children who were praised for being intelligent or for demonstrating effort and hard work would react differently to success or failure on a series of abstract verbal reasoning tasks taken from a standardized test. In the first test, children were asked to choose between “problems that aren’t too hard, so I don’t get many wrong,” “problems that are pretty easy, so I’ll do well,” “problems that I’m pretty good at, so I can show I’m smart,” and “problems that I’ll learn a lot from, even if I won’t look so smart.” This was to test what type of problems the students preferred, but they were told they would only get to work on their choice problems if there was time after they worked on pre-selected problems, so they each had the same expectations about the difficulty of what they were about to do. After four minutes of working on problems the experimenter scored their solutions and no matter what score they achieved, they were told they had solved 80% of the problems, which was a really high score, and were told either “you must be smart at these problems” or “you must have worked hard at these problems,” or a control group received no additional feedback. Then the children were asked again if they wanted to work on easy problems so they would look smart or difficult problems where they would learn more, but all children really received a difficult set of problems and after four minutes of work they were told they had only solved about half of them correctly. After receiving the negative feedback they were asked how much they wanted to keep working on the problems, how much they enjoyed the work, how well they thought they had done, and why they thought they hadn’t done well on the second set. Then they worked for four minutes on a final set of moderately difficult problems to test how well they performed after the failure on the second set. The results showed that children who were praised for their intelligence after the first problem set considered their smartness to be significantly more important to their performance than children who were praised for their effort. 67% of the children who were told they were smart then went on to choose easier problems that they would get right so they could continue to seem smart, while 92% of those who received feedback about how much effort they had put in chose to work on difficult problems that they would learn from. Children who were praised for their effort as well as children in the control condition were more likely to say that they hadn’t done well on the second set of problems because they hadn’t put in enough effort, while children who were praised for intelligence after their initial success attributed more of their failure to a lack of abililty. Children who were praised for intelligence were less likely to want to keep working on problems than the effort or control groups, enjoyed working on the problems less than the other groups, and actually got one more problem wrong in the third set than the first, even though their familiarity with the problems should have led them to achieve higher scores by then. Children in the control group only achieved an average of a tenth of a problem improvement in the third set, which children in the effort group got almost 1 ¼ more problems right on average. So all this is to say that praise for intelligence doesn’t seem to teach children that they are smart, but rather teaches them that when they fail, they can’t change their performance because it’s due to an inherent ability rather than something they can change, like effort. So all of that was the first of the six experiments reported in this paper; the subsequent five elaborated on various aspects of the first one. In the second study, children who were told they succeeded on a first set of problems and then immediately given a chance to choose what type of problems to work on next; the ones praised for intelligence still picked the easy problems, indicating that the effect holds true in success and in failure. In the third study, children who were praised for their ability elected to read information about the performance of others after their second set of ‘failure’ problems, while 75% of the children who were told they must have worked hard chose to read information that might help them solve problems more effectively in the future. In the fourth study, after doing problems children were asked to rate how true is the statement “You have a certain amount of intelligence and really can’t do much to change it,” and were then offered a folder containing information about the performance of other children or information on strategies to solve problems. Children who were praised for intelligence were almost twice as likely to rate intelligence as being fixed than children praised for effort; the control group fell in between. And it was the children who are most concerned with their performance who were most likely to handicap themselves by sacrificing an opportunity to gain information about problem-solving strategies that might have benefitted them. Studies 5 and 6 attempted to eliminate two alternate explanations for the findings; that the experimentor’s perceptions of their abilities impacted their performance, and that the children praised for intelligence might have thought the second difficult set or problems represented an intelligence test, while the children praised for effort would not. Both outcomes supported the original study’s results. I want to take a short detour here and give us a bit of historical context, because it turns out that this study was published at a very interesting point in our development of theories about how children learn. You might remember that we did an episode a while ago on self-esteem, which was all the rage in the starting in the early 1970s. A book called Your Child’s Self-Esteem that is actually still in print today advocated for increasing children’s beliefs that they “have the capacity” to succeed and that this will “turn on their go-power” and “help motivate them to learn.” It can take a while for psychological trends to catch on but in 1990 the State of California released a report stating that low self-esteem is linked to a variety of negative outcomes like poor academic results, drug and alcohol abuse, crime and violence, poverty, and chronic welfare dependency – and as a result, schools began doing everything they could to boost students’ self-esteem. By 1996, when Professors Mueller and Dweck surveyed parents about what they thought about children’s perceptions of their ability and motivation to succeed, 85% of respondents thought that praising a child’s ability and intelligence when they perform well on a test is necessary to make them feel they are smart. The pendulum began to swing the other way in 2003 when Professor Roy Baumeister and his colleagues published an immense 44-page meta-analysis of the research on self-esteem, which called into question all of the findings of the California Task Force Report and found little evidence that self-esteem causes the host of positive outcomes it is commonly believe to cause, and secondly that parents tend to praise children with low self-esteem even more than children with high self-esteem, and that this praise would lead the children with low self-esteem to choose easier drawing tasks just like the children who were told they were intelligent chose easier tasks in Professor Dweck’s test. So self-esteem went out of favor right around the time when Professor Dweck’s work was ramping up, and Mindset theory was poised to take over the baton of the next parenting and pedagogical fad. So now let’s look at some of the criticism of Dweck and Mueller’s paper. The first one is from what I’ll call a non-traditional source, and that’s the blogger Scott Alexander, which is the pseudonym of a psychiatrist who lives somewhere on the West Coast of the U.S.. He expresses extreme surprise that changing a mere three words between the intelligence and effort groups: either “You must be smart at these problems” or “You must have worked hard at these problems” was enough to make any difference at all, never mind the spectacular outcomes that we just saw. Alexander says “this is a *nothing* intervention, the tiniest ghost of an intervention. The experiment had previously involved all sorts of complicated tasks and directions, I get the impression they were in the lab for eat least half an hour, and the experimental intervention is changing *three short words* inn the middle of a sentence,” and he goes on to cite the incredible differences between the results of the children in the different conditions. Alexander also traces Professor Dweck’s publications from her time as a Ph.D student at Yale, and finds a study for which the abstract says that “those subjects who persisted in the face of prolonged failure placed more emphasis on the role of effort in determining the outcome of their behavior,” yet the results section of the paper showed that children who attributed their success or failure to any stable factor, whether that was effort or ability, performed better on a problem-solving task than those who did not. The results weren’t statistically significant because there were only 10 participants in that part of the experiment and it’s very hard to get statistically significant results from such a tiny sample size, but they did hold true across a success and failure condition for both males and females. In a follow-up paper on another tiny sample of 12 children, the findings are described as showing that “persistent and helpless children do not differ in the degree to which they attribute success to ability, but in fact the persistent children in the study did have a higher belief in the importance of ability but the result isn’t statistically significant again because of the small sample size. Finally, in another follow-up paper Professor Dweck and a colleague made the following statement in their discussion section: “It was particularly noteworthy that while helpless children made the expected attributions to uncontrollable factors, the mastery-oriented children did not offer explanations for their failures.” Yet her own data in the Results section of the very same paper show this statement to be false: yes, the helpless children were more likely to attribute their failure to their lack of ability, and the children who believed effort was important were more likely to say their lack of effort was the problem. But the effort-oriented children were also more than 3 ½ times as likely as the helpless children to say that the reason they failed was because the experimentor wasn’t fair, and six times as likely to say that bad luck was the reason for their failure. This flies in the face of decades of research showing that attributing either success or failure to luck gives people the idea that they have no control over their situation and that it’s better to attribute to ability than bad luck. But Professor Dweck finds that children who believe effort is important but flub her problems then go ahead and blame their failure on unfairness or bad luck. In early 2017 a blogger named Nick Brown, who doesn’t state his qualifications but says he and a colleague demonstrated a technique for detecting some kinds of reporting errors in journal articles. They applied their technique to Mueller and Dweck’s original paper because it had lots of tables of results with means and standard deviations and small sample sizes that their technique could use. They found 17 inconsistencies out of 50 means reported in the paper, and got in touch with Dr. Dweck and to her credit, she quickly responded to say she would look into it and within a month had produced a 16-page paper explaining the errors. Some were attributed to unclear or omitted reporting in the article, and most of the rest were typos or transcription errors. I mention this only because if you choose to look into Mindset more yourself then you may come across this idea of errors in the paper and I wanted you to know I’d looked at it. Though 17/50 is a lot of errors, none of them seem to have impacted the results of the study. The bigger issues that I see, though, is that the results of the main study on which all the subsequent work is based have never been replicated, which is astonishing for such a seminal work, because replication is considered a necessary part of the checks and balances on scientific data. Indeed, two researchers at the University of Edinbugh tried but were specifically unable to replicate them. Their work hasn’t been published in a journal, but you can read it online for yourself through a link in the references. And secondly, her very own research as a grad student seemed to contradict the results she said she found. Yet she went ahead and published the book Mindset in 2006 in which she coined the now-famous terms fixed mindset and growth mindset, with the fixed mindset being the attribution of success to fixed traits like intelligence, and the growth mindset the attribution of success to elements within the individual’s control, like effort. In the years between 2006 and the new edition’s publication in 2016, a number of researchers, many of whom have been or are Professor Dweck’s students or direct colleagues, have picked up the baton on mindset research and we’ll discuss their findings in a minute, but firstly I wanted to detour again to tell you about my own first experience at reading the book. I read it primarily from the perspective of wanting to know its relevance to my daughter, but I was surprised to find it also relevant to my own life. Now, I have never been good at drawing. I’ve never had any kind of art instruction, beyond a frustrating exercise in primary school in which we were to copy a painting and I spent the entire class trying to match a single color of paint, ending up with a bucket of mixed paint in nothing approaching the right color. But I’d always just assumed that there are some kinds of people in the world who can draw, and others who can’t, and I’m one of the ones who can’t. In the book, Professor Dweck showed some self-portraits of people who thought they couldn’t draw and they looked much like how I would draw myself. Then she had those very same people go through a drawing technique class and do self-portraits again at the end, and they were actually astonishingly good. Not professional artist good, but legitimately-looks-like-a-real-person good. So good that I tracked down a copy of the book Drawing on the Right Side of the Brain, which uses the same techniques as the ones used in the class described in Mindset, and I set out to see if I could draw. And, shockingly, it turns out that I sort of can. If you access this show through my website, you probably saw the picture of the running shoe in the header image – well, I drew that. (If you don’t access the show through my website then head on over there right now and subscribe, because not only do you get to see my amazing drawings but I also send out cool newsletters to my subscribers with information on new research on child development and calls for question on topics I’m researching and other fun stuff). I won’t claim that my drawing is a masterpiece, but it’s recognizably a shoe and it’s something I would never have attempted to do and *wouldn’t have known how to attempt to do* before I read the book. My husband got me some drawing supplies for Christmas that year, right before I got busy working on master’s degrees and starting this podcast, and now I’m finished with those I might one day get back to it. Because it turns out that if I put effort into it, I can actually draw. So, despite the tenuous nature of the studies underpinning the book Mindset, subsequent researchers have taken the idea and run with it. Not much of that research has focused on children who are our focus, in the toddler and preschool years, but Elizabeth Gunderson at the University of Chicago, along with Carol Dweck and others, conducted a study in which researchers visited 53 children and parents in their homes 3 times at 4-month intervals starting at 14 months of age, ostensibly for a study on language development. The researchers recorded typical daily interactions, and then coded these interactions as process praise, like “you must have tried hard,” although it also encompassed “good job” and “good running.” Person praise implied that the child possessed a fixed, positive quality like “good girl” and “big boy,” and other praise included things like “good” and “wow!”. When the children were in second or third grade, they answered some questions about their motivational frameworks on two visits, 3 months apart. Praise varied between 0.5 and almost 8% of parent’s total utterances to their children – the higher number is one in every 12 ½ things a parent says to the child! It turned out that the more process praise (which is praise for trying hard) that children received at a young age (as a percentage of total praise), the more likely they would be to attribute their success or failure to characteristics they could change, rather than to their inherent abilities. I was surprised to see that the total amount of praise was not linked to how the child attributes their successes or failures, given the extensive literature on that topic that we reviewed in the episode Do You Punish Your Child With Rewards. Yet I was shocked to find that even the abstract of the study, normally reserved for the sunniest possible interpretation of the data, states that “parents early praise of inherent characteristics was NOT associated with children’s later fixed-ability frameworks,” which means that parents who used process praise were more likely to have children who believed in the value of effort, but parents who used person praise did not necessarily later have children who believed their abilities were fixed. Nevertheless, this study is invariably cited in support of the idea that parents should use process praise on their children. If we continue chronologically through children’s lives, the next main study before the mushroom of studies we see on the high school and college years asked about mother’s praise of 120 children aged about 10 years, as reported by the mothers in daily phone calls with researchers over a period of 10 days. While self-reporting is often not a very reliable method of collecting data, the researchers made the apparently-reasonable assumption that recounting the day’s praise used was a fairly accurate way of summarizing the parent’s responses to the day’s school successes. The abstract here reports the sunny findings: the more parents praised inherent characteristics, the more children believed that intelligence was not malleable and avoided challenging tasks. But the Results section holds a little surprise for us – mother’s praise of the process, or effort, did not predict that their child would be more likely to believe that intelligence is malleable, or improve the child’s preference for challenging activities. So, in short, praising inherent characteristics is bad, but praising effort doesn’t help the child either – which directly contradicts the findings of the previous study. Once again, I direct you back to our episode called “do you punish your child with rewards” and encourage you to consider whether praise is really necessary at all. So how does a child change their mindset? For a while, researchers assumed that children model their teachers’ and parents’ mindset, just like they do their other behavior, or that parents’ expectations about the child’s mindset would somehow cause the child to develop that mindset, in the same way that parents’ and teachers’ perception of a child’s competence predicts the child’s own perception of their competence. But it turns out that parents’ mindsets about intelligence is not significantly related to their children’s mindsets, but rather the parents’ beliefs about failure as motivating or demotivating, as well as their responses to their children’s failure, that predicts children’s responses, and this relationship held even when the researchers controlled for the parents’ perception of the child’s competence. I should point out, though, that the article by Kyla Haimovitz and Carol Dweck is shown in corrected form in the journal, because apparently the title they originally gave it, because “the previous title (and certain sentences in the book) overstated the link between parent’s own intelligence mindsets and their children’s intelligence mindsets.” More worryingly, the study’s results section presents a table showing a correlation between parents’ failure mindset and children’s intelligence mindsets. The researchers used a value called “p” that must usually be less than 0.005 for a finding to be considered significant, but the study’s results says these factors were only correlated to p<.5 – ten times greater than it should be to show significance. Yet the study’s discussion section to discuss the results as if the *were* statistically significant. Assuming there is some kind of relationship here, this finding has the alarming implication (for many parents) that all the “Good jobs” in the world won’t actually help your child to develop a growth mindset, but it’s whether you accept and allow them to fail, and help them to figure out what happened and how they could do better next time, that’s far more important – and potentially more difficult as well. It’s also possible that children can change their mindsets based on information they are given about what children in social groups do. One fascinating by Dr. Andrei Cimpian of the University of Illinois and his colleagues gave children aged 4-7 some new puzzles to do. If they were boys, they were told either “boys are really good at these puzzles” or “girls are really good at these puzzles” or “there’s a boy who is really good at these puzzles.” The girls received similar messages as well, stating that girls were good or not good at the puzzles, or that there was a single girl who was good at it. It turned out that it doesn’t matter whether the children thought they belonged in the group that DID or DID NOT do well at the puzzles, if they thought there was a group of children who did the puzzles well, their own performance dropped. The researchers believe that children build theories to explain and understand what they observe, and when an adult tells them that children like them are either good or bad at the task, the children come to believe that they don’t have much control over their achievement outcomes, because their success or failure is a function of their membership in a group rather than due to any effort that they put in. Just like with Dr. Dweck’s work – and she actually wasn’t involved with this study – the effect was generated so easily by someone the children barely knew saying just a few words about a stereotype of people that, in one of the group’s experiments created a difference in performance between groups who were and were not exposed to the stereotype information that were comparable with the baseline difference in performance between 4/5 year-olds and 5/6 year-olds. As we move up to look at school-aged children, a study by Dr. Dave Paunesku and others at Stanford including Carol Dweck, has found that an online 45-minute intervention where students read an article describing the brain’s ability to grow and reorganize itself as a consequence of hard work and good strategies on challenging tasks caused these students to earn satisfactory grades in core academic courses at a 6% higher rate than a control group, which was a statistically significant difference. But the devil is (once again) in the results section – the intervention actually seemed to be correlated with a small *reduction* in the GPA of students who were not at risk of dropping out, with a rather larger positive effect size on students who *were* at risk for dropping out. Perhaps this is actually a good finding for educators, but for the parents of toddlers and preschoolers who are probably among the more advantaged children out there, this finding is not exactly what one might have hoped. Much of the research on mindsets is typically experimental in nature – children report information about their mindset, they are assigned to an intervention to change their mindset or a control that gets generic information about the brain, and they probably also have to do some weird problems that they’ve never seen before to assess what happens when they succeed or fail, and then they are asked again about their mindset. Professor Jennifer Schmidt at Michigan State University and her colleagues wanted to try a more naturalistic approach – they did a fairly intensive in-class intervention with 369 students in one full science class per week over six weeks. The students were divided between 7th and 9th grades, with a racially mixed and relatively economically disadvantaged sample. At the end of the study, 9th graders who went through the growth mindset intervention reported feeling more in control of their learning, which was the primary variable studied, but the effect did not hold for the seventh graders, whose sense of control dropped over the study period just as much as the control group. The researchers observe that there is a universal decline (in the U.S. at least) in interest in science education over the course of a student’s school career that this intervention did not counteract in 7th graders. The researchers observed that this loss of interest and motivation for science may occur because students have few opportunities for autonomy in science learning, or because they view science content as challenging, or, conversely, because they don’t think teachers are challenging students enough. The first part of the explanation is the most consistent with research that I reviewed for my Psychology master’s thesis on what motivates children to learn, which is that children learn what is interesting to them. To me, this gets at the crux of the inconstant findings related to mindset research in schools, where students are told to be interested in a topic because it’s on the curriculum, and not because they find it inherently interesting. Mindset interventions aim to increase a student’s competence at learning, but do nothing about this issue of a lack of control over WHAT they are learning in the first place. Perhaps the better thing to do would be to get rid of curriculum and then we might find we didn’t need mindset research any more. Professor David Yeager, who is now at the University of Texas at Austin but was formerly Professor Dweck’s student at Stanford, has emerged as the next bearer of the Mindset torch. He says research and theory suggest that that there are three conditions needed to successfully implement a mindset approach: it (1) successfully targets students’ beliefs about themselves and their educational environments, (2) is delivered in a psychologically precise and potent way, and (3) taps into recursive processes in school (virtuous cycles) that sustain the effects of the initial intervention. Looking at these one by one, he is saying firstly that researchers need to understand the specific beliefs students have to know how to change these. For example, both Native American and African American students have been shown to be highly unmotivated by a typical individualistic approach of changing your mindset so you can do better in school. African American students preferred communal values showing that “it is a good idea for students to help each other learn” and that “they can learn a lot of important things from each other,” while a predominantly Native American school apparently exhibited a dramatic turnaround after instituting an intervention in which the predominant message was “you help your community when you grow your brain” – although I have to say that I couldn’t find the specific paper describing the Native American case, and rely on Professor Yeager’s description of it. The challenge, of course, is to tap into characteristics that are universal enough to allow the intervention to be scaled, but specific enough that the students see the as relevant. This can be especially challenging among students who don’t see the point of school, both in the short and long terms. Some students may see their day-to-day work as irrelevant, since it was chosen by someone else and because they don’t find it interesting. These are precisely the kinds of students that the mindset proponents want to reach, but to me it seems like our task is a difficult one – we’re essentially saying “if you work harder and use different strategies you could get better at these things you don’t’ care about.” One way we might be able to get around this would be to ask students to set long-term goals and see how graduating from school will help them to achieve these goals, even if school seems like a waste of time in the short-term. The second point, delivery in a psychologically precise and potent way, means that we make use of proven techniques to change the way people think. So rather than just telling students over and over again “if you work hard you will succeed,” it is better to involve students in developing their own strategies to overcome challenges and then help students get these strategies ingrained in their brains by suggesting that they teach the strategies to someone else. So when a student struggles with reading comprehension, rather than telling him to read the passage again, work with him to come up with ways of improving his comprehension like asking a classmate to explain words he doesn’t understand, or looking up words in the dictionary. He can then share these strategies with other friends whom he sees struggling – or might even share the higher-level information on mindsets about working hard and developing their own strategies to overcome problems. We can also use the “people like me” tactic – people are more inclined to do something when “people like me” do it too, which is why telephone sales people will tell you that “a lot of people find solution X valuable” (and solution X happens to be the mid-priced solution, so you feel better for not buying the most expensive thing). Just think back to my example with the drawing – I saw the drawings by “people like me” who couldn’t draw and who learned how to draw, which made me believe that I could learn how to draw as well. So when students feel that “people like them” can graduate school and go to college if they put their mind to it, they are more likely to study, do homework, and set goals to achieve school graduation. The final point about tapping into recursive processes in schools is about using things like natural transition points as good places to introduce interventions. It’s normal for students to feel anxious when they start or change schools, for example, so helping them to develop growth mindset strategies in this period when they are receptive to new information about figuring out how to make the new system work for them can mean they retain the information more effectively. In fact, Professor Yeager has done some good initial work to improve GPAs and reduce the risk of dropping out at the University of Texas at Austin. Another problem with implementing the growth mindset in schools is that unless someone does develop an online program that is somehow massively scalable and yet also relevant to individual students’ needs, we rely on teachers to implement the intervention. Professor Jennifer Schmidt from MSU did a study where she worked with two teachers whom she calls Donna and Celia, who implemented a mindset program. Both teachers expressed interest in the intervention and were found to have a growth mindset in terms of science intelligence. Yet the way in which they actually taught was very different. Celia was more likely to compare students against each other, emphasize that a student was one of the best, remind them about points or grades, offer a reward, and contact parents with either a positive or negative report. She did also endorse telling students that hard work is the key to success and was more likely to report teaching strategies for learning than Donna, although the practices that the researchers actually observed Celia doing were quite different than what she said. Professor Dweck calls this a “false growth mindset” – where we say “I have a growth mindset” but our actions don’t reflect this statement. When handing out a worksheet she would say “I know this is boring but it’s easy peasy and you are going to be tested on it.” When her students were challenged academically she would offer immediate help, instead of emphasizing the importance of challenge and effort for learning, which could have conveyed the message that students were incapable of addressing challenges on their own. Celia would also set up competitions between classes such that if her class beat the other class’ performance then they could do less work or get bonus points on a subsequent quiz. Both teachers implemented the same mindset intervention, and both said they believed in the value of the growth mindset, but the messages they conveyed to their students were very different, and Celia’s messages were at odds with the messages in the intervention. This likely explains why Donna’s students were much more likely to believe that intelligence is malleable and also achieved significantly higher grades than Celia’s both immediately following the intervention and at a follow-up. And this intervention was conducted with two teachers who were really interested in mindset, which is not always how it goes – a more common way that mindset approaches are introduced into schools is that the administrators learn about it and, a week before classes start when the teachers have already spent the summer preparing their lectures, the administration says “do it this new way, or else.” One master’s student at the University of Texas at Austin interviewed teachers who said that the blanket mindset approach was implemented without regard to individual students’ needs, which made teachers feel a loss of control over the way they could teach in their own classroom. Perhaps we shouldn’t be surprised that the last decade or so of focus on mindsets has failed to result in any appreciable increase in objective measures of student achievement (since these are the measures administrators care most about), when they are implemented by teachers who aren’t given much opportunity to learn about it, explore it, and develop their own growth mindsets before using their new knowledge to benefit their students. This finding was echoed by the results of a national survey of more than 600 kindergarten-grade 12 teachers by the online news organization Education Week, which found that 98% of teachers think that using growth mindset in the classroom will lead to improved student learning, but only 20% of teachers strongly believe they are good at fostering a growth mindset in their own students even though 85% have been trained on it. We know that one-and-done professional training doesn’t work, so if we really want our students to develop a growth mindset we need to a better job of training teachers to teach it. As we head toward a conclusion, I want to think a bit more holistically about mindset and its implications for use in our classrooms. T self-determination theory of motivation which is a highly influential theory although, unfortunately, our schools have yet to incorporate all the elements of it. SDT says that all people have a need to experience autonomy, competence, and relatedness and that people will be highly motivated to engage in activities, and will perform better, with greater persistence and creativity, when all three conditions are met. Mindset addresses one of these three issues in that it aims to increase a student’s competence. But it still leaves out two very important areas which we have now seen are also important – the autonomy to feel as though one controls one’s own actions rather than being controlled by others, and relatedness with other people like teachers and students. Taking autonomy first, as we’ve discussed, the reason we find it hard to motivate students – the reason we need to motivate students – is because somebody else has decided what they need to learn and how they should learn it and how much of it they should learn and when, and it really isn’t any wonder that a lot of them aren’t so interested in that approach. If we changed the way we operated schools and allowed students to follow their interests then we might still need to help them develop new strategies for attacking problems after they fail, but we probably wouldn’t need to try to get them to work harder. We are trying to teach students that they have control over their outcomes, when a great deal of the control in a learning situation is actually held by the school. In a report for the Bill & Melinda Gates Foundation (itself a proponent of testing to ensure educational quality), Professor Dweck describes many of the outcomes we’ve already discussed, but goes on to examine other topics that can also have an impact. One is social belonging, which is the idea that students form relationships with teachers and with other students that make them want to succeed, which corresponds to the relatedness of self-determination theory. Perhaps you remember a special teacher who took an interest in you, and that caused you to stick with a subject you might otherwise have abandoned. Professor Nel Noddings’ work focuses on the importance of teachers caring for students and students caring for each other, and a study of her ideas found that perceived caring from teachers was related significantly and positively to students’ academic effort, as well as to internal control beliefs (or the belief that one can control one’s own destiny). This should cause us to examine the highly individualistic nature of the growth mindset, which says that the effort you put in is something that is within your power to change, for which you are responsible for changing so you can achieve more. As we already saw, there are many students for whom that message simply doesn’t resonate much, and for these students caring is especially important. Ironically, it may be these students who miss out the most on caring relationships with teachers, since we know that it is more difficult for people to form empathetic and caring relationships with people who are different from them, and the more than 80% white teaching workforce is not well aligned with the more than 50% of students who are of non-dominant cultures in the U.S.. Professor Dweck also notes the importance of self-regulation and self-control, which she says is an even stronger predictor of success than a student’s IQ score, although the graph from our old friend Professor Duckworth of the episode on Grit actually does not support this assertion for all students. Self-discipline does predict academic performance better than IQ for students in the highest and second-highest quintiles, but this relationship did not hold true for the students in the lowest three quintiles of academic performance. I went back to Professor Duckworth’s paper in which she says “these results suggest that self-discipline has a bigger effect on academic performance than does intellectual talent” when, firstly, as I’ve just explained, those results only hold true for high achievers and secondly, the study only looked at correlations between the two factors and not causation – it is possible that doing well in school leads one to develop a growth mindset. So self-discipline is also an important factor, but may not be as important for all students as IQ – a largely hereditable trait, and not one that can be taught. We should also acknowledge that there’s an inherent discrepancy between what we say when we value a growth mindset, and what schools use to assess academic progress. When we say we value a growth mindset, we say we embrace trying new things, and failing at them, and learning from those failures to develop new strategies to be successful on difficult, challenging tasks that are important to a student. But what schools actually reward is the ability to memorize information the school says is important and pass a standardized test on that material, because that’s how states judge schools’ quality, it’s how parents judge schools’ quality, and under the unfortunate Race to the Top initiative that came out of the Obama administration, it’s how teacher quality is measured as well. So perhaps we shouldn’t be enormously surprised that the last decade or so of implementing growth mindset interventions hasn’t led to any increase in test scores across the country, which tend to hover between the 25th and 50th percentile on average, in reading and math, in both 4th and 8th grades. In addition, Professor Duckworth and Professor Yeager collaborated on a paper which specifically argued against using non-cognitive measures like grit and mindset for accountability purposes until better measures are developed, but the State of California is ignoring those recommendations and implementing tests of mindset as part of measures of school district success anyway. Finally, I want to address the assertion that a changed mindset is the thing that will help poor children to overcome their unfortunate circumstances and excel in school. Susana Claro was a Chilean doctoral student of Professor Dweck’s, and used a massive Chilean dataset to look at this. The Chilean government administers a standardized math and language test to all 10th graders in the country every other year; it also surveys the student, their family, and the school and in 2012, it began including a short form of the test that Professor Dweck uses to measure students’ mindset. Students with a growth mindset outperformed their fixed-mindset peers at every family income level to a statistically significant degree. Students’ mindsets and family income were linked, and students from the lowest-income families were twice as likely to have a fixed mindset as students from the top families and schools, a pretty impressive finding. To their credit, the authors do not try to claim that teaching students a growth mindset is a substitute for systemic efforts to alleviate poverty and economic inequality. Instead, they argue that structural inequalities can give rise to psychological inequalities that end up reinforcing the impact of structural inequalities. So we shouldn’t say “Look, poor people, if you just shifted your mindset that you could get yourself out of this mess,” but rather, as we work on reducing structural inequality that shifting toward a growth mindset could be another tool to use to support historically disadvantaged students. In reality, we will never be “all growth mindset” just as we never were “all fixed mindset.” I was able to shift my fixed mindset related to drawing, but while I believe my fixed mindset related to my math ability probably could be shifted if I put the time and effort into it, I haven’t yet had the time (or prioritized the effort) to make that happen. So, in conclusion, what are we to make of this mess of studies that have Professor Dweck’s fingerprints, as well as a host of statistical and other errors, all over them? Well, it does seem safe to conclude that if you work harder at something you are more likely to succeed at it, and two big meta-analyses of studies related to mindset and found that people who believe human attributes are malleable rather than fixed, and who work hard to achieve their goals, are generally more likely to engage in behaviors and strategies that would improve their performance. Some wise sage a long time ago told us that insanity is doing the same thing over and over again and expecting different results, so the idea of trying a different strategy if the one you’re currently using doesn’t work seems to make intuitive sense. Professor Dweck has noted that she isn’t motivated by money; she does get $20,000 for a speaking engagement but says told a Buzzfeed reporter that “I care much more about my credibility and my legacy, my contribution, than about any financial compensation.” It does seem possible that her desire to create and protect this legacy has led to some slightly dodgy statistical work that may well have overstated the magnitude of the potential impacts of mindset shifts. So, feel free to encourage your child to try hard, to use new strategies to overcome problems, and to help them see that they haven’t mastered a concept *yet. * Just don’t expect it to be the single variable that helps your child succeed or, if you are fortunate enough to live above the poverty level, be even a particularly important factor in their later success. If you’d like to take a look at any of the 32 research papers, blog articles, and the like that I reviewed for this paper, you can find them at yourparentingmojo.com/mindset.